When people engage with interactive media - from video games and digital art to applications on mobile phones and netbooks - their interactions leave digital traces. This creates possibilities to graph and analyze interactive experiences in detail - something which was not possible if you wanted to analyze interaction with traditional (non-digital) media, such as reading a novel or watching a movie. VideoGamePlay.viz project investigates these possibilities using recordings of people playing video games. Some of these recordings are done in our own Game Libratory; others come from the web collections of demos and speedruns (such as archive.org). We use computer vision techniques to analyze the videos of gameplay, keylogs recordings, and video capture of gamers' faces. The data is visualized using techniques drawn from information design, media design, and GIS. Timeline showing temporal patterns in gameplay modes during one session of "Knights of the Old Republic." 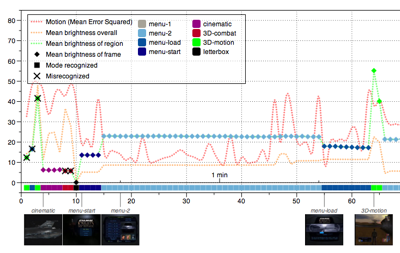 Timeline showing temporal patterns in gameplay modes during one 5min session of "Rez." 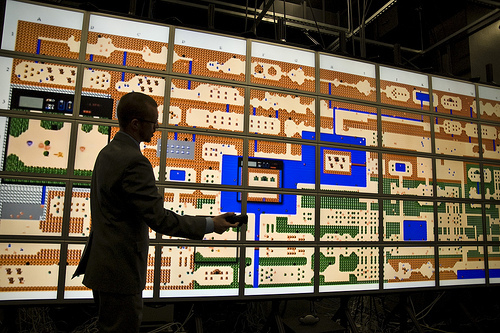 Multiple gameplay screen recordings embedded into a large composited map of "Legend of Zelda" game world. One such recording appears in a black square, center screen.